Above: Creag na h-Inghin on a finer day! Parking at Chisholm Bridge currently contains heavy machinery and construction materials. This is not a problem at weekends but parking will need to be sought elsewhere during the week. AgzyGroove Gillies posted on The 'Sláinte Mountain Quiz (MQ) page on Facebook "Anybody up for a walk on sunday way me n the Beags if the weather holds out, heading for Tom n Toll n Glen Affric at Cannich". So it came about that I headed for Gen Affric to meet up with Alan with his two beagles and Hayley with her Rhodesian Ridgeback. 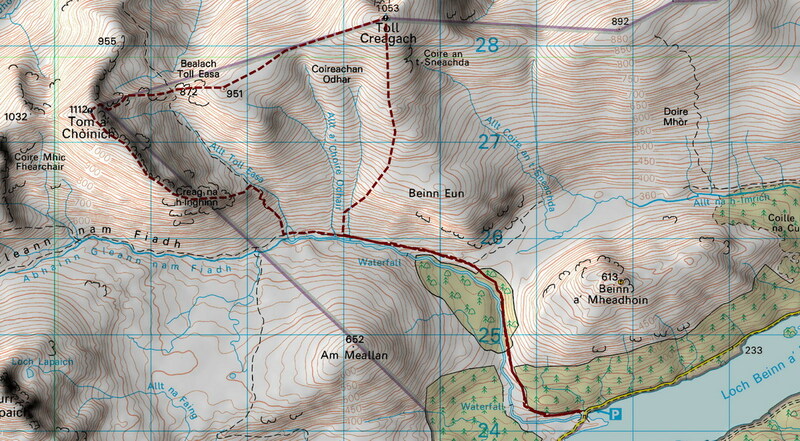 We all headed up the ugly bulldozed track towards the Creag na h-Inghinn ridge of Tom a'Choinich. I wonder what Scottish Hydro will do to repair the damage to the landscape and how long it will take for nature to reclaim the bare earth and track. It'll be interesting to come back in ten years. At the moment, the development is an eye-sore and, to my mind, like slashing a great work of art. The weather had progressively worsened as we headed up the track and onward to the base of the Creag na h-Inghinn ridge. Alan and Haley became concerned about their dogs which were beginning to look a little cold. They therefore decided to head back to the cars while I continued up the ridge. It was great meeting up wit them, if only briefly. The conversation meant that I didn't really notice how bad the track really was until the descent. The path up Creag na h-Inghinn is clear and of just the right gradient - one that means gaining height quickly without being to strenuous. 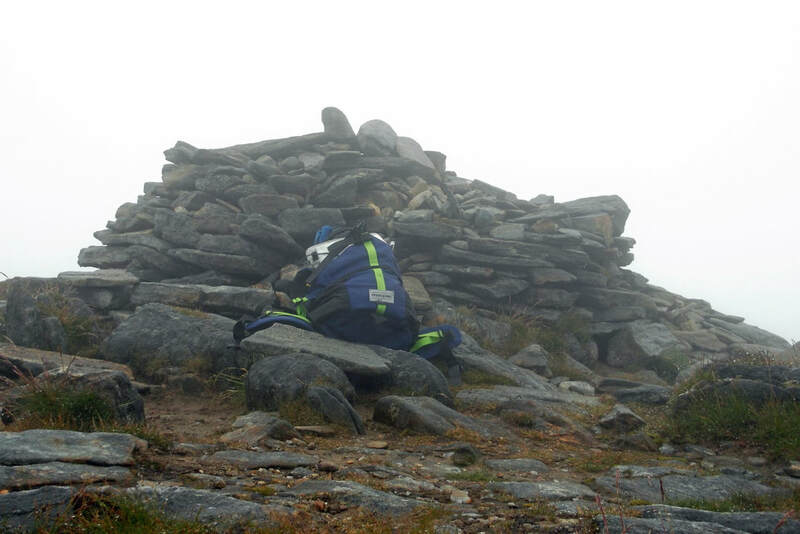 I encountered some blustery weather on my way up, but the wind eased and the rain stopped as I approached the summit cairn. I tried several attempts to do a summit selfie using the time delay on the camera but the results were poor. I overturned a flat rock to expose its dry side and sat down to enjoy some chicken Fajita wraps. A compass bearing from the cairn led to a good clear path down to the bealach where I stopped for a cereal bar and watched a herd of deer making their way across the Corrie below. 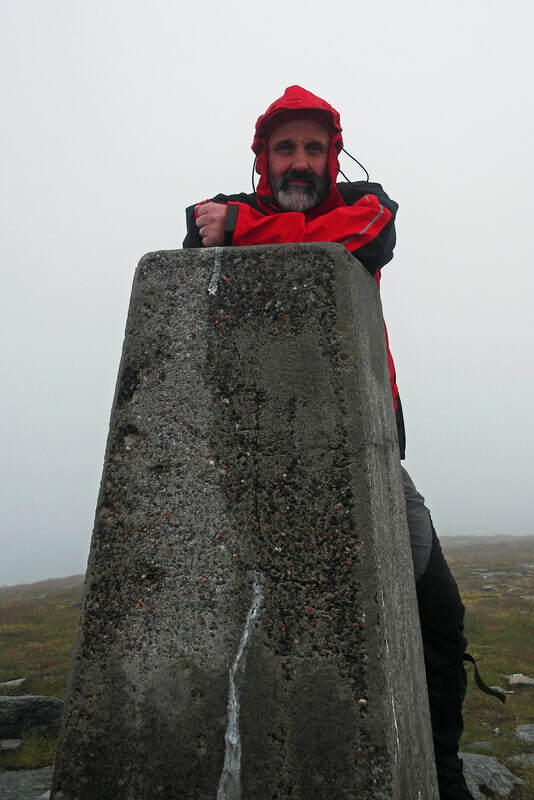 The climb up to Toll Creagach was not too steep and intermittent paths could be followed to a widely spaced cairn and trig point, the latter being slightly lower. It was by now dry and the wind had dropped but thick cloud precluded any possibility of any decent photographs. Taking a bearing down, I had not descended far before I heard someone calling out to me. Alex had met Alan and Haley and had been pushing the pace on an attempt to catch me up. We continued together as far as the dam where Alex stopped to take some photos of the dam while I continued down to the car. A day on the hill on poor weather reminded my of the days when I traveled up from Yorkshire and headed out onto the hills regardless of the weather. I rather enjoyed the extra challenge of walking in poor visibility, the main downside being the inability to take any decent photos.